A Unit Card represents a military unit in the game. 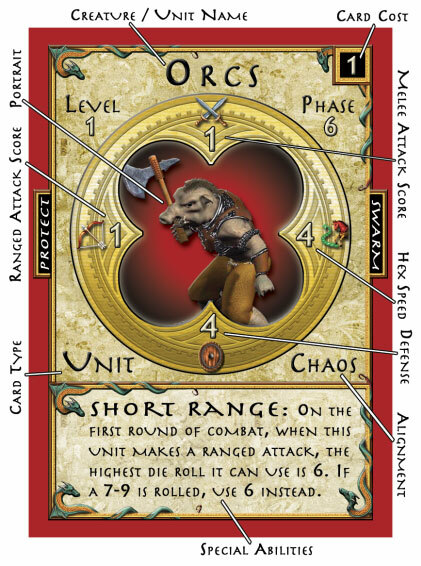 Also called Creature Cards, Unit Cards are used to create Creature Stacks, which are the main body of the Army Stacks you will move around the board. Unit Cards can be stacked with others of the same type to form a Creature Stack for use in a battle, so you will want several copies of the same Unit Cards in your deck. Below is a diagram you can refer to when the rules mention the entries on a Unit Card. by DGA Games and may not be copied or reproduced. All rights reserved.